Passed away 12.04.2019 aged 92. Beloved husband of Eileen (dec). Adored father and father-in-law of Kenneth (dec), Lyn and Barry, Jan and Martin, Karen and John, Sandra and Bruce, Grandad of eleven, great grandad of sixteen. Reunited with Eileen. Will be greatly missed. 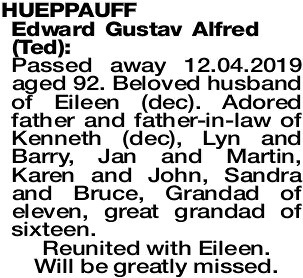 The Funeral Service for the late Mr Edward "Ted" Hueppauff will be held in St Stephen's Lutheran Church, Hassell Street KATANNING, on WEDNESDAY afternoon (24.4.2019) commencing at 1:00pm. Following the Service, the cortege will proceed to the KATANNING Cemetery for Burial. A gentleman who always had time for a chat.